← E-Reader or “Real” ? First birthday ~ first cake! Some call it weeds, we call it Easter Grass! This entry was posted in Oklahoma, random photos, spring, Tulsa. 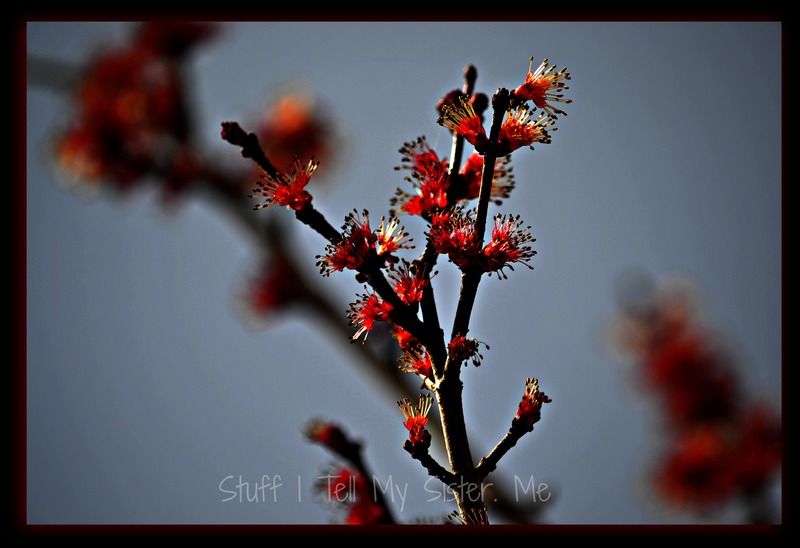 Oklahoma and tagged Bonnie, First Birthday, Henry Van Dyke, Mark Twain, Nursery, Plant Turck, Random Spring Photos, Robin Williams, Sitting Bull, spring, Spring Quotes, Taxes, What Spring Brings, Winnie-the-Pooh. Bookmark the permalink. Oh my word, that was awesome. You just rock! Well, you know that I of course LOVE this post, and I am not biased in the least! Nope,not at all. Are you stalking me, Bonnie?!?!? lol! 😉 It would be too boring. Let’s stalk my sister! Ok! Much more fun to stalk someone together!! More fun….more trouble….hope we get the same jail cell! The dancing liberty girl has her crown upsidedown. I think everyone is anxious for the weather to warm up (in the northern hemisphere, that is). It has been such a long winter. Love your inspiring spring photos. Great post – love the cake photo! Just wonderful!! The first cake is so precious, Winnie-the-Pooh produces the best lines for quotes, and the Easter Grass is lovely. Queen Anne’s Lace is regarded as an allergy weed here, but I love it. I drove home from my mother’s today in a blinding snow squall. I hope your weather gets over here soon!! We have have a chance of sleet/snow predicted for here in the a.m. But this too shall pass! This seems to be true for so many of you ‘Northern Hemisphereans’. Down here in Australia it is currently Autumn/Fall however, I will be really happy when it happens; we are experiencing a very long Summer in most areas…. Yes, we saw a great quote – some think of their garden as a retreat, I think of mine as an attack! love the photos and oh I too am anxiously awaiting throwing open windows, dusting out the bunnies under the beds, shaking off the winter blahs and moving into lovely lilac aromas!!! This has been the coldest spring I can remember. It’s still below freezing this morning. Yikes. I washed off the patio furniture and the water froze in little icicles. Does this mean a cool summer ahead? Please accept the award! You deserve! … Thanks to Shaun friend! You have more images of spring in your neck of the woods than we do down here. It is still mostly dead except for the Bradford Pears. I do have a lot of “Easter Grass.” What a great name for it. I always get mad at Clint when he mows it down before egg hunt day. It is a perfect place to hide eggs. 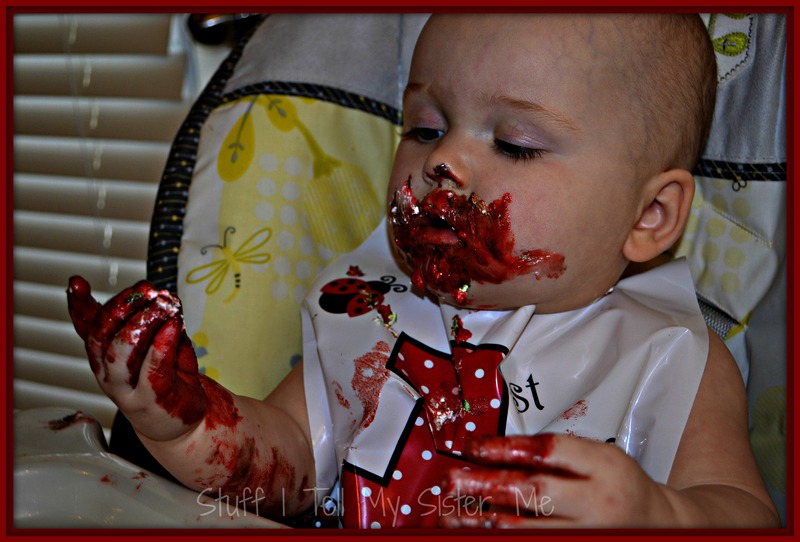 The grands birthday cake looked very – uh, messy! Did that deep red stain his little fingers and mouth? What a doll; he looked like he was having the time of his life. I want to get out an find spring here, but its turned off cold and miserable here and I’m sick for the first time in over two years! Its supposed to freeze this weekend, I hope my redbud tree survives. Redbuds are supposed to be the smartest of the trees. We’ll see! This little one is a friend’s doll baby. She had lots of fun, but was ready for a nap by cake time! We don’t pretreat our 5 acres so we have lots! you are welcome to some. lol! well thanks! What a great hunt that could be! I hope it is nice enough for a hunt this Easter, we definitely have lots of “Easter Flowers” I had planned to give them one cutting before Easter, but then I got really sick. Now I’m hoping I get my house clean before Sunday. Its not looking to good. No need to clean house….it’ll just get messed up with all the foot traffic. A thought! I think you are right, but I will have to give the front bath a bit of attention so as not to gross out my family and friends. I love this! great post,reminds me I need to get to the nursery so I can get the plants in the ground so the sun can fry them. Here in AZ I already have a tan, it’s in the 80’s! Oh 80’s……we had ONE 80’s day last week and it was awesome. 40’s and sleet today….but before long I’ll be fussing because of the heat. Enjoy!!!! My bed of wildflowers are blooming, my pots by the front porch are filled with petunias, and I’m heading out to enjoy the 75 deg. morning. My very favorite time of year here in AZ. However, I do find the Haboobs and Monsoon season pretty exciting (from inside the house). Your photos were beautiful, as usual. Thanks Paula. It’s almost tulip season here. Enjoy those perfect temps and flowers!! Still chilly here! ♥ to you, Delores!